The news that Tiger Woods withdrew from the 2014 Arnold Palmer Invitational shouldn’t be particularly concerning for fans of the No.1 ranked golfer in the world. Woods has won the Arnold Palmer Invitational eight times in his career, and with a ninth would break the all-time record for most wins at a single event by any player in history. Woods loves playing at Bay Hill, probably almost as much as he loves playing at Augusta. 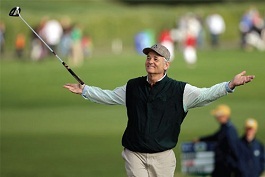 That love for playing in the Masters could be the underlying theme here. With the 2014 Masters less than a month away, Woods and his team probably knew that the only way his back has a chance of being 100 percent for the first Major Championship of the year was to take an extended break and focus on resting. Woods probably needed some tough convincing to withdraw this week on the advice of his doctors and surrounding cast. If anything, Woods has been stubborn and hard-headed in the past when it comes to injuries. He has routinely played at less than 100 percent and has probably missed more time because of it. The fact that Woods is 48 and his window of consistently contending for Majors is dwindling likely played a factor here. Woods is not a fast healer like he might have been 10 years ago. The fact is that his body is quite a bit different. While Woods remains in fantastic shape, he is approaching 40 and the body reacts to events differently. While we might not get a chance to see Woods in action at Bay Hill this week, we all would much rather see him 100 percent at the Masters the second week in April. Woods remains at 14 Major Championship victories, with the last coming in 2008 at the U.S. Open. If Woods does not win the Masters, it will be a full six years since that U.S. Open victory that Woods will have last won a Major Championship. That seems almost impossible considering how he has been in contention over these last six years, only to fail to produce. The way that the slate of Majors sets up in 2014 though is very appealing for him. Woods has Major wins on three of the four courses, with the only one he hasn’t won on being Pinehurst for the U.S. Open. In 2005, the last time that U.S. Open was held at Pinehurst, Woods finished second to Michael Campbell. At the very least, Woods has to be confident that he has had plenty of success on the Major Championship venues for this season. This entry was posted in News, Opinion and tagged arnold palmer invitational, tiger woods on March 20, 2014 by Bryan. How Will Tiger’s Back Affect Him Heading Into The Masters? It’s clear that the last two tournaments Tiger Woods has entered he has not been 100 percent healthy. In fact, one resulted in a withdrawal during the final round, and the other resulted in a final round 78. Actually, had it not been for Woods’ withdrawing at the Honda Classic, he might have withdrawn at the Cadillac Championship for the second-straight week in the final round. But instead he gritted it out to finish the tournament. This entry was posted in Uncategorized and tagged 2014 masters, tiger woods, tiger woods injury on March 14, 2014 by Bryan. Jason Day Captures Accenture Match Play; Major Championship Next? Add Jason Day to the list of top players that has yet to win a Major Championship. This entry was posted in News, Opinion and tagged 2014 accenture match play, 2014 masters, jason days on February 24, 2014 by Bryan. 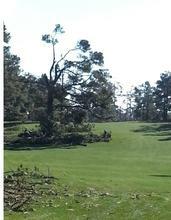 Arguably the most-famous tree in golf was removed this past weekend thanks to a series of ice storms that made their way through the Southeast. Going forward, Augusta National and The Masters will be without the Eisenhower Tree. This entry was posted in News and tagged 2014 masters, augusta national, eisenhower tree on February 17, 2014 by Bryan. We’ve grown accustom to hearing the name Woods atop the world of golf. But for the first time there is another Woods that has won a professional tournament. Cheyenne Woods, the niece of No.1 ranked player in the world Tiger Woods, captured the Australian Ladies Masters over the weekend. This entry was posted in News, Opinion and tagged cheyenne woods on February 10, 2014 by Bryan. The AT&T Pebble Beach Pro Am is one of the fun events on the PGA Tour, and it gets going this Thursday. Looking down the list of notable names of celebrities that will be on hand competing, many of the typical players on in there. This entry was posted in News, Opinion and tagged 2014 at&t pebble beach pro am on February 3, 2014 by Bryan. Tiger Woods Missed Secondary Cut At Farmers Insurance Open; Cause For Concern? 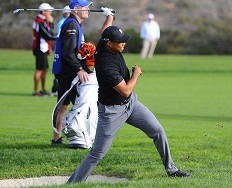 Many thought that Tiger Woods would come out and win the 2014 Farmers Insurance Open this past week. After all, he had won the event seven times before + Torrey Pines is a golf course that he loves to play. After the first couple of rounds Woods was right around the cut line, needing a low third round to shoot back up into the conversation. Woods needed an eight-foot putt on the 18th hole Saturday to stay-off an 80. That’s right, Woods carded a 79 during the third round. What’s more, is that Woods missed the secondary cut on the PGA Tour. A secondary cut is a cut made at the 54-hole mark when there are more than 78 players playing on the weekend. Those players still get paid for making a 36-hole cut, but do not get the chance to compete on Sunday. Now of course the questions center on Tiger and his upcoming events. Woods was rather positive on his performance though. Rather than categorizing it as catastrophic with the big number 79, he merely said he was a fraction off. On a golf course like Torrey Pines’ South layout that can easily turn a 69 into a 79. But it is rather concerning considering the success the No.1 ranked player in the world has had. I say let’s cut him some slack for this one. It’s one event. And not just that, it’s the first event he’s played in 2014. If Woods puts up some more mid-70s rounds through February and March on into the Bay Hill, then around that time we can begin to seriously question what in the world is going on. But until that point comes, let’s just sit back and watch him get his year underway. We probably won’t see Woods until the Accenture Match Play Championship, so that is not even a stroke play round. His next stroke play event will likely come at the Honda Classic near his home in Florida to open up the Florida Swing. Another player who had difficulties this week was Phil Mickelson. Lefty admitted he had back pain during the tournament and had to get several treatments. This is the first time in his career that Mickelson has undergone back treatments. However, he is no stranger to playing in pain with the arthritis in his joints. Woods and Mickelson aren’t getting any younger that’s for sure. But still I think we can expect these two to have some good years in 2014. This entry was posted in News, Opinion and tagged 2014 farmers insurance open, phil mickelson, tiger woods on January 27, 2014 by Bryan. This entry was posted in News, Opinion and tagged 2014 farmers insurance open, phil mickelson, tiger woods on January 20, 2014 by Bryan. The two tournaments in Hawaii have concluded, with Zach Johnson and Jimmy Walker taking home the titles. Now, the PGA Tour opens up with the West-Coast swing for the next month and a half spanning California and Arizona. This entry was posted in News, Opinion and tagged 2014 pga tour season, humana challenge, pga tour west coast swing, tiger woods on January 13, 2014 by Bryan. Tiger Woods announced that he will begin 2014 on a familiar venue. As expected Woods will play in the Farmers Insurance Open at Torrey Pines, a tournament he has won seven times + the 2008 U.S. Open held there. This entry was posted in News and tagged 2014 farmers insurance open, tiger woods, torrey pines on January 7, 2014 by Bryan.